Safeguarding your personal financial information is more important than ever. Every day we hear about new risks and new ways our personal financial information can be compromised. So, more than ever we all need to know the basic ways to keep our finances secure. Whether you’re someone who regularly files away hard-copy bank statements or manages everything online, there are ways to minimise the risk of your financial information falling into the wrong hands. 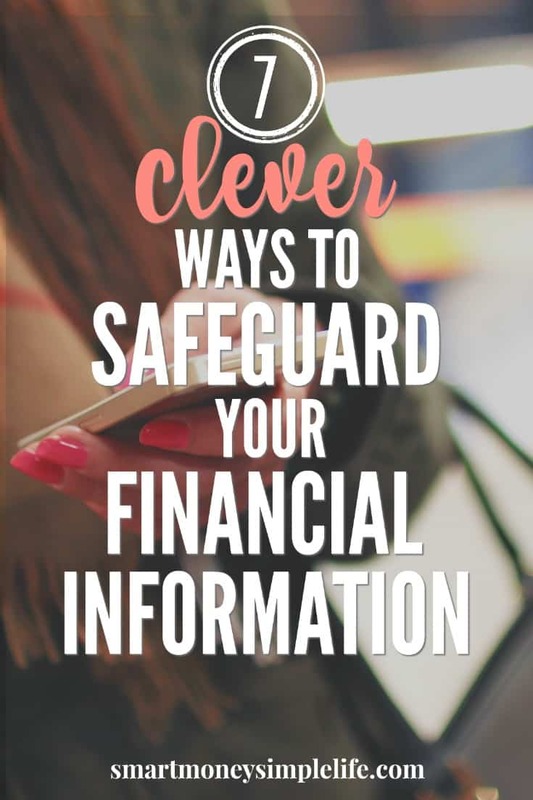 Here are seven clever ways to help keep your information and your money safe. Also, make sure you regularly remove receipts and either file them or dispose of them sensibly. Keep everything else in a secure place at home. Lost your wallet or had it stolen? Don’t waste a moment, freeze everything! Make sure you notify your bank immediately and get your cards, credit and debit, frozen. Cancelling cards and waiting for them to be reissued is a pain, that’s true, but it’s nothing compared to having your financial information or money stolen. This is also why it’s a very good idea to keep the cards in your wallet to a minimum. If your wallet disappears, for any reason, you still have access to credit should you need it. “Phishing” is the attempt to gain your personal financial information by masquerading as a legitimate business entity. Internet scammers attempt to get you to provide your financial information or account and password details through emails (usually) as well as texts. The frightening part is that these notifications can appear to come from companies you already deal with and the emails often look just like that company’s other email communications. Never click a link provided in an email even if you believe it is from your bank or credit card provider. If you’re ever in doubt about an email or text, ring the company or check their website for notifications regarding phishing emails. Most companies will never ask you to click a link to log in to your account for just this reason. The bottom line here is, if in doubt, ask. Everything needs a password these days and remembering them all can be challenging. Don’t go for the easy way out and use the same password everywhere. That’s like handing an identity thief the master key to all your financial information. Complicated passwords are by their nature harder to guess and therefore more secure. They can be harder to remember, too. So, the trick is to use a phrase and mnemonic rather than a simple word as your password, and ensure you include upper case, lower case and characters in your password. Here’s an example: My tabby tortie is way too cheeky becomes MtTi@2c. In this example, @ = way and 2 = too. The other thing to remember is to change your passwords regularly. For a relatively small price, you can have anti-virus software installed on your computer. Set it to update automatically and you know you’ll always have an extra layer of security over all your financial information. This is especially important if you do all your banking online. There are a number of different companies providing anti-virus software like McAfee , Norton and Kaspersky . Another aspect of your computer’s security you need to consider is how you access the internet. If you’re using free wifi in a library, internet cafe or shopping centre, or even at work, the information you upload and download is available to whoever provides that internet access. Only access sensitive information from your own secure internet connection. And, make sure your home wifi is password protected. The same caveats that apply to using your laptop on a public wifi apply to using your smartphone. Mobile apps are simple to use and have made it easy and accessible to handle our finances on-the-go but if you’re dealing with your financial information, make sure you’re not hooked into public wifi. Limit paper mail as much as possible for a variety of reasons, not least of which is reducing the ways in which your financial information can be acquired. For the paper-based financial information you can’t avoid, invest in a paper shredder and ensure all those papers are destroyed properly. That includes old financial papers you no longer need to keep and be sure to shred promotional credit applications or credit limit increases that come your way. It’s not possible to avoid all financial related mail so make sure your mailbox is secure as an unsecured mailbox is an invitation for thieves to steal your identity. How safe is your personal financial information? What ways do you keep your personal financial information secure? Let us know any safety tips we missed!